Eduardo Rodriguez is probably the guy least talked about when discussing the Red Sox youth movement. He’s only 24 years old, the same age as Mookie Betts and Xander Bogaerts, and will turn 25 just after Opening Day. He’s a major league-caliber starting pitcher with some success, and he’s made notable progress every season he’s been in the majors. The reason why Rodriguez isn’t talked about as much is because, well, he hasn’t done much to talk about, other than gradually improve in a way that isn’t too flashy. Mookie Betts is just incredible, Xander gets a ton of hits, Rafael Devers plays with a fun, explosive wildness, and Andrew Benintendi is solid or better at pretty much everything he does. Rodriguez isn’t bad, just young, and since he’s a pitcher, he’s volatile by definition. It’s really not Eddie’s fault here. Despite all that potential and pedigree, Rodriguez hasn’t been able to put together a full season yet, thanks to ineffectiveness or, more recently, injuries. With most pitchers, it’s the elbow. With Rodriguez, it’s his knee, and that same knee has made sure that Rodriguez will have to wait until 2019 to pitch a full season in the majors. Remember those incremental improvements? He had some more this year. His strikeout rate jumped up four percentage points from last year, settling at 25.8 percent, a career-high for the southpaw. This wasn’t just a fluke either – Rodriguez got more whiffs this year than he ever had. It showed in his great first half, as he held opposing hitters to a .219/.290/.416 line while notching 65 strikeouts in 61 innings. His best start of the year, however, came in the second half in Yankee Stadium, where he shut down New York’s offense for seven innings, and even touched 96 at one point. With how bad the Red Sox have been in regards to developing starting pitching, this could honestly be listed as a minor miracle. Rodriguez was, at the very least, a solid starting pitcher in 2017. He didn’t hurt you too much, his high points showed glimpses of what he could become, and he totaled more WARP this year than he had in the last two seasons combined. He’s getting there. Just give him time. He might be getting there, but his knee is trying to trip him up every step of the way. Before his start on June 1st in Baltimore, Rodriguez fell over while warming up in the bullpen. That looks pretty innocuous, right? Turns out it was a lot worse. Rodriguez’s start went poorly, and he was placed on the disabled list the very next day with a right knee subluxation. That right knee is also why he had a late start to the 2016 season, and why the Red Sox were worried about him when he was playing winter ball. He didn’t return until after the All-Star break, and other than a couple great starts, Rodriguez was hit-or-miss for the rest of the season, thanks to the instability of a balky knee that potentially affected everything from control to velocity. Statistically, he didn’t really regress anywhere, but didn’t really improve some key parts of his game. Rodriguez still has issues getting grounders, and that put him at risk of turning into batting practice with all the homers the league was hitting. While the four home run game in Baltimore was a product of a hurt knee, being a fly ball pitcher with half your starts in Fenway Park isn’t a precursor for success. The improvement there will probably come, sure, but he wasn’t really a guy to induce a ton of grounders anyway, and the current homer-happy environment of MLB could really slow progress here. That troublesome knee had to be fixed sooner or later, and the Red Sox decided on sooner. Best guess? He won’t pitch until June, and that’s if everything goes as planned. Sometimes his rehab starts don’t go well, and he has to spend another week in Pawtucket to get sharp. That happened a few times in 2017, and as David Price so emphatically pointed out, Dennis Eckersley was not a fan of one of those starts. 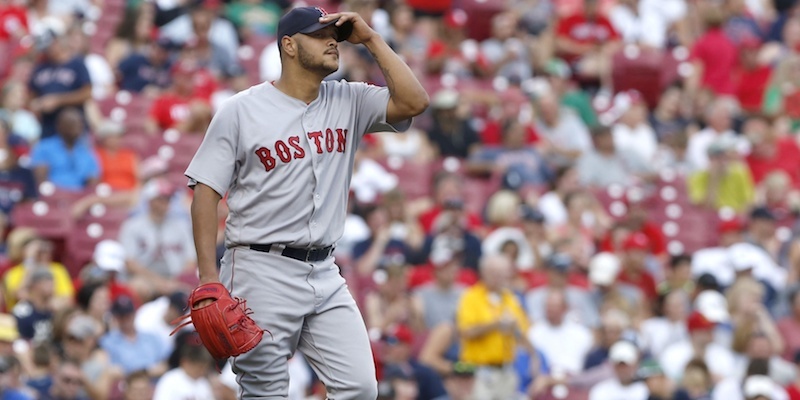 Regardless, it’ll be a while until we see Rodriguez take the mound in Boston. It’s hard to predict how he’ll do coming back from that, but if he can get 120 innings in 2018, that has to be seen as a success, health-wise. As for performance, it’s probably not wise to bet against Rodriguez taking another step forward. Maybe he’ll start inducing weaker contact, and cut down on the homers. Maybe he’ll walk fewer batters while the strikeout rate keeps steady. Everything’s there for a breakout season, and were he a lock for the Opening Day roster, I’d probably say he’s due for it. We can only hope he comes back healthy for the long run, because if he keeps getting better at this pace, we might see yet another good left-handed starter in the Red Sox’s rotation.